Simple and yet filling, these moist, flavorful chicken wraps are easy to make and always a hit! They are perfect for quick, last minute meals. 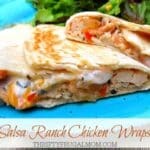 I love quick and easy chicken recipes and these Salsa Ranch Chicken Wraps that I created several years ago are no exception! Fast, easy and bursting with flavor, they make a great lunch or light dinner. It doesn’t matter if I make them for guests or just us, these simple chicken wraps always get devoured in a flash! Looking for a great place to get quality fresh chicken? Check out Savory Butcher! They are a growing company and aren’t available in all areas, but are slowing expanding their market! They regularly have boneless, skinless chicken breast for $2.19/lb. And they also have ground beef for $3.19/lb. as well as bacon, ham and other meat too! Simple and yet filling, these moist, flavorful chicken wraps are easy to make and always a hit! They're the perfect quick meal! Spread 1/3 c. chicken down the center of each tortilla. 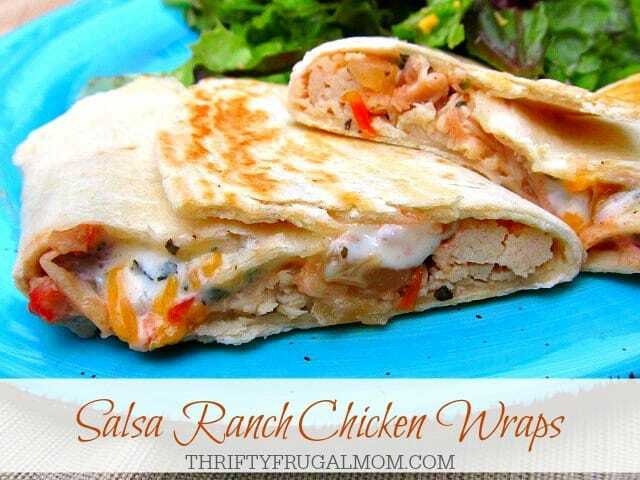 Top chicken with Ranch dressing and salsa, 1 Tbsp. per tortilla. Fold ends of each tortilla over filling. Melt butter in skillet. Place folded wraps in skillet, seam side down. Cook over medium heat for 3 to 4 minutes on each side or until lightly browned and cheese is melted. These look delicious! I know my family would love them! WOW- these look amazing. I can't wait to try these! Holy yum! This sounds so good! Visiting from Women with Intention. I host a link party every Sunday night, I’d love it if you’d stop by and share this! A favorite around here! It's especially great for a quick summer meal. This does sound wonderful!! Will add it to my list, yum!! Mmmmm .... these look so yummy! I'll have to check with my mother about trying them out sometime. Thank you so much for sharing the recipe! We love how easy and simple they are, Sarah! One of my go-to recipes for a quick meal! Shannon, I just use whatever I have on hand. Sometimes it's bought, sometimes it's homemade. As long as it's salsa you like, you should be fine! Hi! It looks like there is rice in one of them. What type of rice did you use. I would love to make these tonight! They look amazing! Vannessa, no rice in them at all! I think what you are seeing is either chicken or possibly onion from the salsa. When I use rice for other recipes though, I love using Basmati. It's not as starchy as white rice, but not as "stiff" as brown and just has an excellent flavor. If you have an Aldi nearby, they have it for a great price! Just tried these and they were GOOD! I was surprised how fast they went together and how quick the cleanup was. The toasty brown from heating them in butter made them extra good. Thanks--this one's a keeper! Love that you all enjoyed them so much, Annette! Thanks for taking the time to let me know. Quick, tasty dinners are the best, right? I made these tonight into burritos and oh boy they were delicious. Full of flavor and yumminess. Thank you for sharing. So glad you enjoyed them, Erinne!